Sharing Kyoto's writers went to Mibu-dera Temple to see what this Kyogen pantomime is all about! 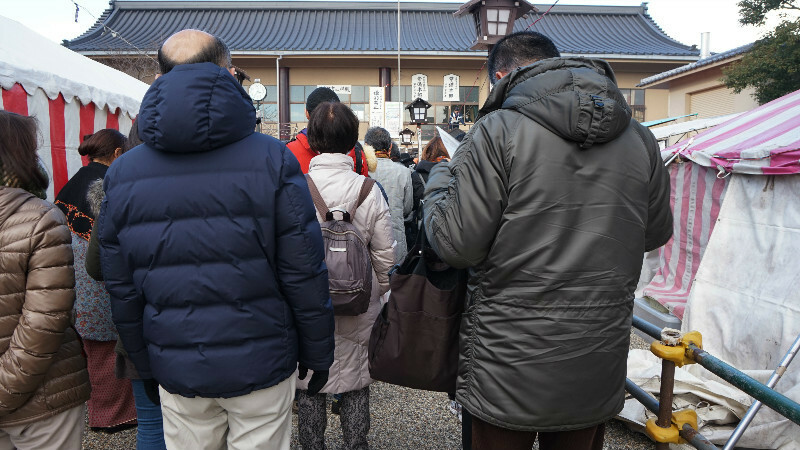 Although many shrines and temples have their own setsubun festivals, Mibu kyogen which is held at Mibu temple is a one of the famous festival among Kyoto. The 45 minutes setsubun Kyogen will give us fun and Kyoto especially performance. Not only Kyogen, but also horaku-wari is a rare ritual. 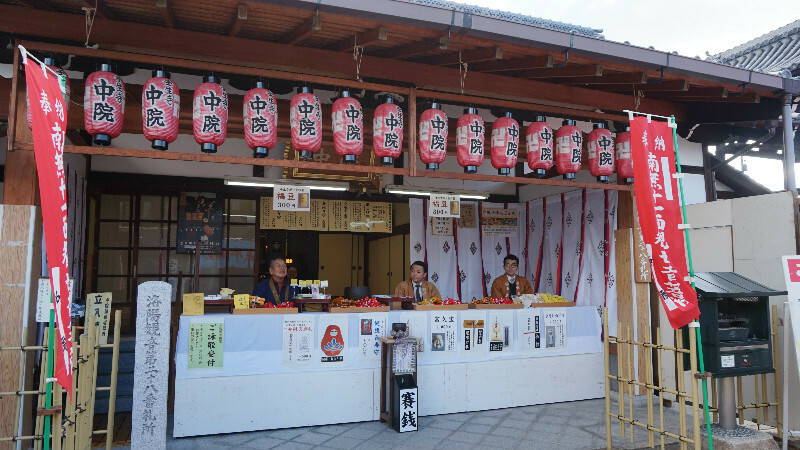 Mibu temple is a simple and small temple, but a lot of fun and rare events are held during the festival (from February 2th to 4th. Especially, it is a rare opportunity to see the Kyogen for free. Kyogen is performed without words, so you can enjoy it easily even if you can’t understand Japanese. Please feel Japanese traditional culture! 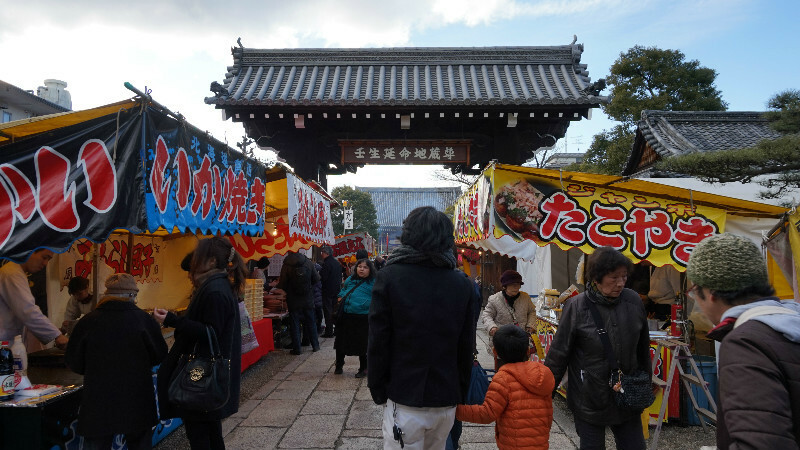 One of the stalls was offering the ‘Horaku. 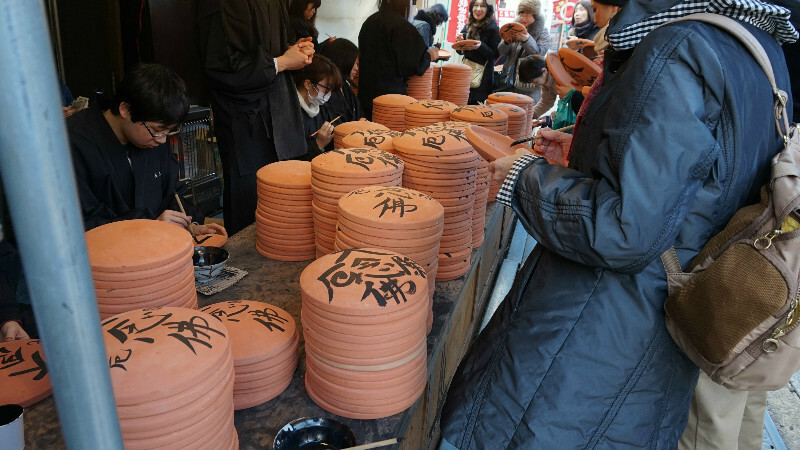 A unique feature of setsubun at Mibu temple is the writing on Horaku (炮烙) or unglazed ceramic plates. People write their wishes with a brush on the plates and then, submit them to the temple. In Kyōgen, they will be all smashed to bring a good fortune. Rare amulets in the shape of Dharma or Jizo(guardian deity of children) are sold during the setsubun festival period. Dharma is round shaped and red colored, it is one of the Japanese auspicious doll. Dharma or Jizo amulets will protect you from calamities and difficulties. 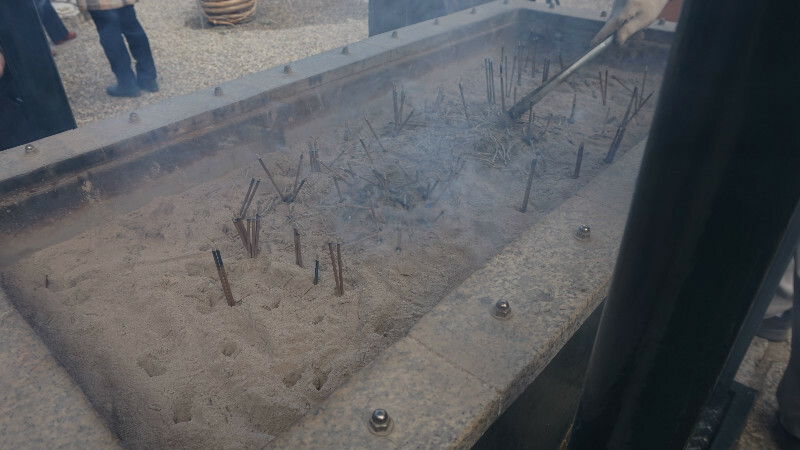 People burn osenkos (incense) and blow them out after a few seconds of lighting it. 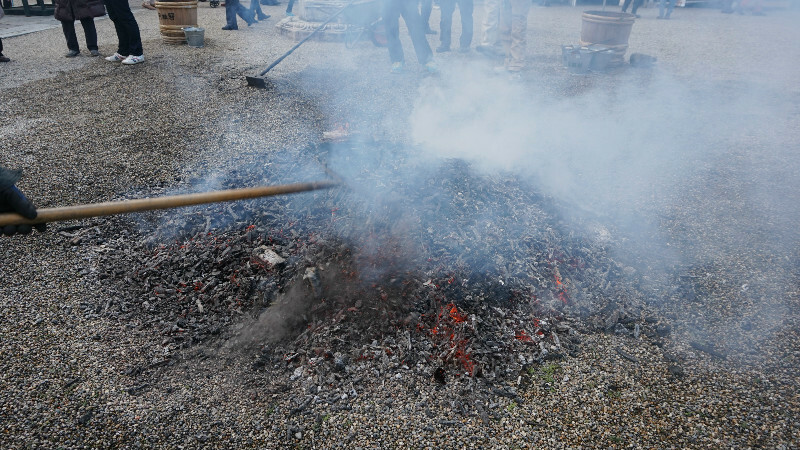 As the smoke is believed to bring powers, they try to get the smoke they burn towards them. 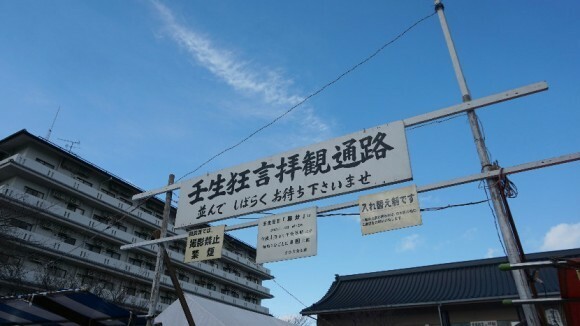 The praying to rebel bad spirits was held at the main hall on February 2th. This is a gate of the Kyogen venue. They are held 8 times from 1pm to 9 pm continually for 2 days (February 2th and 3th). Taking photos and movies insidethe venue is prohibited. A line was made even it was 50 minutes before the start of the Kyogen! They are waiting for a previous Kyogen performance to finish. Since the venue is outside, I recommend wearing a lot of clothes. Unfortunately, I could not take a photo, but, I was really fun !! Actors in masks perform with the sound of bells, drums, and flutes. This sound was really simple, but strongly went through a cold air. In addition to that, Kyogen doesn’t have words during the performance. Actually, it was the first time for me to see a Kyogen. I had thought that Kyogen is boring, difficult and plain… But this thought was my misunderstanding. I was completely drawn into Kyogen ina second after Kyogen start. I highly recommend enjoying Kyogen during the setsubun event. It is free of charge! You can feel free to join it!